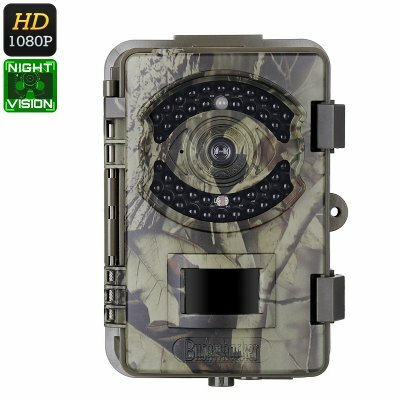 Successfully Added 1080p Trail Camera - FHD Video, 16MP Pictures, PIR Sensor, 20m Night Vision, IP66 Waterproof, Time Stamp, 2.4-Inch Display to your Shopping Cart. This Full-HD trail camera makes sure that you’ll never return empty-handed from a hunting trip again. With its built-in camera, this hunting gadget allows you to analyze and track the behavior and routines of the game you’re hunting. It features an IP66 waterproof design which means that you can use it without any worries in any environment. Additionally, it is capable of operating in temperatures ranging from -30 to 70C which means it works perfectly regardless the climate you’re in. With its powerful battery, it treats you to 6 months of standby time – allowing you to use it throughout the season without needing to recharge its battery. As a true high-end hunting camera, it treats you to different recording modes. The trail camera supports a PIR sensor with adjustable sensitivity. It features a range of 20 meters in a 90-degree angle – meaning that not a single movement stays uncaptured. Whenever movement has been detected, your trail camera will instantly shoot a picture or start recording. All media can be stored automatically on a 64GB TF card thanks to its micro-SD card slot. Recordings can either be watched back instantly on the camera’s 2.4-Inch display or later on at home on your PC or laptop. With its 42pcs of IR LED lights, this 1080p trail camera lest you analyze the behavior of animals at both day and night. 20M night vision ensures that you’ll even be able to clearly see the routines of your game after dark. It is capable of producing Full-HD 1080p footage and 16MP pictures. The camera furthermore comes with a built-in microphone and speaker thanks to which it treats you to high-end audio that comes along with all your footage. This 1080p trail camera comes with a 12 months warranty, brought to you by the leader in electronic devices as well as wholesale outdoor gadgets..